/ Home / About the university / Teaching and learning / Inclusivity / How can I be more inclusive? Provide flexibility in how information is delivered and discussed such as giving instructions verbally and visually. Use a variety of teaching strategies, activities, and assignments that will accommodate the needs of students with diverse learning needs, abilities, backgrounds and experiences. Be aware that being engaged does not always mean speaking up and there could be multiple reasons for students not participating in activities. Allow for a range of opportunities for participation - from group discussion, to individual reflection - to allow all students to demonstrate their abilities. For further guidance on making teaching more interactive download the 7 Steps to: using group work in your teaching. Making sessions interactive can be more difficult with larger groups but positive strategies include setting up peer activities to enable students to learn from each other. The 7 Steps to: enhancing large group teaching provides further guidance. It is recommended that teaching sessions should be for a minimum of two hours. This maximises the scope for more active learning with students, facilitating a move away from the traditional didactic lecture. Academic staff will need to design a varied session that will engage students and enhance learning throughout the two hours. Consideration should be given to how to structure the session using a range of teaching methodologies. This Sheffield Hallam University guide on Teaching in the Active Learning Classroom supports the adoption of active learning approaches. Recognise and value your students by approaching teaching sessions with an ethos of partnership, where both students and staff are seen as belonging to a community of learners. Find ways to connect with and learn about the uniqueness of all students through ice breakers and personal reflection activities. Creating dialogue can be more difficult in large groups so facilitate peer-to-peer discussions to encourage students to support each other. Encourage students to use the self-evaluation tool to support and assist with personal tutoring - this online self-assessment tool (PU staff and students) – set up in Moodle - evaluates students early engagement with learning. It provides automated feedback, helping to identify students at risk and directing them to appropriate resources and sources of support. Never make assumptions about someone based on broad categories such as being mature or disabled. People are complicated and their identities are defined by more than simplistic labels. Talk to students about how specific issues affect them, if at all. Ask the student if they have specific requirements or concerns and negotiate together how you will address this in your teaching practice. You may not be able to meet all their needs but communicating what is and is not possible and why is an important step towards a mutually respectful teaching relationship. For specific guidance on fostering effective relationships as a personal tutor, download the 7 Steps to: effective personal tutoring. Set expectations about what support students can expect from you and provide appropriate timelines for getting back to them. If you are busy and cannot reply to a student email, students appreciate being informed of the delay and offered an alternative, rather than being ignored. Provide flexibility in the way students can contact you such as by email as well as face-to-face office hours, recognising that we all have different communication preferences. Be aware of what support services are available in order to refer students on to the right place. These services also exist to provide guidance to academic staff on how to teach more inclusively so if in doubt, ask the experts. See the Teaching and Learning Handbook for a comprehensive guide to teaching, learning, assessment and student support at University of Plymouth as well as our directory of key inclusivity people. Provide flexibility in how students demonstrate their knowledge and how you assess this, by varying the assignment type (for example presentation, lab report, reflective portfolio) and allowing choice in assignments, where appropriate (for example between topics or allowing students to set their own questions). Be clear about how students will be assessed, talk through the marking criteria and provide justifications for what you expect from them and why. Design staged tasks to include a series of smaller formative steps, to prepare students for the final summative assessment. For example if the assessment is a presentation, include mini-presentations within module teaching. Regularly seek student feedback to inform practice and tell students why and how you have done this, so they know their feedback means something and will have an impact on current and future students. For further advice on making assessments more inclusive download the 7 Steps to: inclusive assessment. Take time to reflect on your own practice, asking questions such as how your own social and cultural assumptions might affect your interactions with students, how students’ backgrounds and experiences might influence their motivation and engagement, and whether your course materials can be made more engaging and accessible to all students in the class. Diversify your curriculum; in certain courses it may be appropriate to check who is included and excluded from your module curricula and reading list. For example, if you are teaching a course on modern british literature and all your authors are white males from England, it would be worth reviewing your curricula to consider whether a diverse list would be more relevant and critically engaging. For further advice on making your teaching culturally inclusive download the 7 Steps to: adopting culturally inclusive teaching practices and for advice on internationalising your curriculum download the 7 Steps to: internationalisation. Trainee teachers with SpLD may find the support document useful to assist their preparation for school placements. An introduction to getting it right for disabled student placements. Guidance for students prior to during and after your placement. Guidance for University staff working with disabled students on placement. Guidance for placement providers working with disabled students on placement. The key to inclusive fieldwork, off campus learning activities and expeditions is curriculum design, planning and preparation for both staff and students. Extensive information is available on the field trip and off campus activities web pages. LABplus is an open access laboratory at University of Plymouth in the Davy Building designed to enhance students practical field and laboratory skills .LABplus contains a range of laboratory & field equipment in addition to bespoke resource boxes. Each resource is designed by academic and technical staff to support modules & enhance students understanding of laboratory and field techniques. LABplus case study. Inclusive Laboratories, Studios and Workshop guidance from the University of Westminster. Consider developing videos and podcasts to induct students and prepare them for laboratory work. View the MMU video on practical microbiology and the University of Leicester video on using a micropipette. Supporting students with Asperger's syndrome. HEA. This resource pack includes videos and quick guides and, is designed to help staff support students with Asperger's syndrome (AS). Designed primarily for those working in the physical sciences, much will also be of use for those working in other subjects. The pack is designed to be flexible so that each department can use it in the way that best suits their way of working. Embedding equality and diversity in the curriculum: a physical sciences practitioner’s guide HEA. 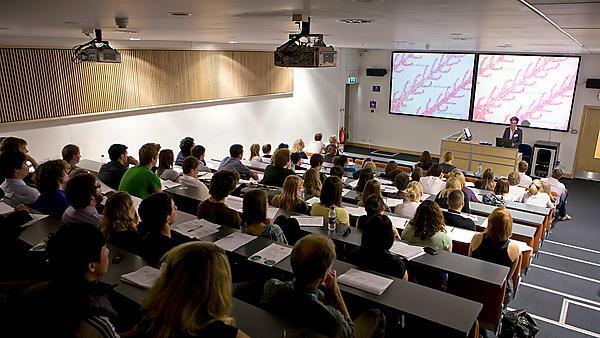 Easy strategies for making large lectures interactive include a quick show of hands, paired or small group discussions or short individual activities such as writing a one minute summary of the lecture. It does not have to be complicated; it just has to occasionally get the class ‘doing’ rather than simply listening. The 7 Steps to: enhancing large group teaching provides further guidance. You can easily ensure that your content is inclusive by making materials visually clear and checking that examples, illustrations and case studies are accessible (i.e. jargon is minimal and cultural references can be universally understood). More broadly, review your curricula to see whether it includes literature and examples that reflect diverse and global scholarship on the topic. Establishing effective channels of communication can be more difficult for large cohorts. When you first meet your students, introduce yourself, talk about your research interests and explain how your role as lecturer or personal tutor supports their learning. It is also important to clearly communicate what your students can expect from you and set realistic timescales for responding. Remember it is not all down to you - make full use of the student rep system to encourage students to support each other. Build a sense of community by creating plenty of opportunities for students to work together in class to support and learn from each other. Download the quick advice about inclusivity, which summarises the points listed above. Complete the inclusivity checklist to review your current practice and identify areas for improvement. Watch the videos below of staff and students giving advice about how to be more inclusive. See our case studies of good practice for ideas of inclusivity initiatives from other colleagues. Watch our student experience videos to see students talking about the benefits of inclusive teaching and learning. See our list of key inclusivity people if you would like to talk to someone about a specific inclusivity issue. The JISC guide to supporting an inclusive learning experience in HE. The University of York St John has developed an Inclusive Teaching and Learning Framework and guidance. The University of Birmingham has published LGBTQ – Inclusivity in the HE Curriculum: A Best Practice Guide. Universal Design for Teaching & Learning Universal Design is a principle-based approach to designing university teaching and learning to meet the learning needs of all students. Universal Design (UD) offers a framework that helps to consider and embrace diverse classrooms. The UD framework offers the tools to take all learners in to consideration when planning and designing the curriculum. The University College Dublin publication on Universal Design offers comprehensive guidance on the framework. A self-evaluation tool to support assist with personal tutoring: this online self-assessment tool (University of Plymouth staff and students) – set up in Moodle - evaluates students’ early engagement with learning. It provides automated feedback, helping to identify students at risk and directing them to appropriate resources and sources of support. Learning to teach inclusively: a multimedia open access course for HE staff. OpenLearn works and University of Wolverhampton. Learning to teach inclusively: video collection contains many podcasts to assist staff in developing inclusive teaching. OpenLearn works and University of Wolverhampton. Many apps are available to support learners with SpLD. The ‘Wheel of Apps’ identifies relevant apps and categorises them according to some of the difficulties faced by people with SpLD. University of Cambridge Annual Disability lectures.